The front door of Kettell Hall opens out on to Broad Street and, because it was still a private house when numbers were allocated to the street in the 1840s, it was given the number 54. Since 1883, it has been part of Trinity College. 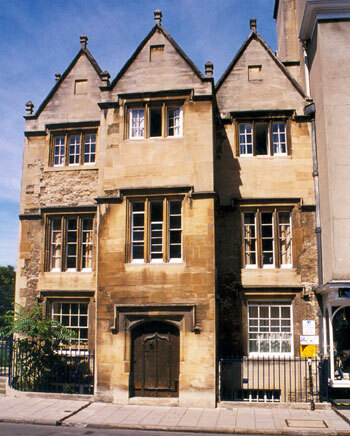 In 1616, the house in this position is described as “Late in tenure of George Calfield, Esq” (MP for Oxford), suggesting that it was empty and about to be rebuilt. Anthony Wood in 1641 wrote that ten baptisms in the parish register of St Mary Magdalen were of “the children of Georg Cawfield recorder of the citie of Oxon, living somtimes in that house in Canditch which was pulled down for the building of Kettell Hall…”. The old house was known as Baner Hall. 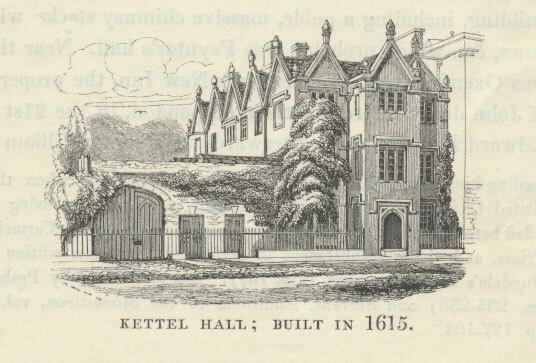 Kettel [sic] hall still remains on the north side of Broad street; built in 1615 by Dr. Ralph Kettel, president of Trinity college, for the use of students, on the site of an ancient hall called Perles, and by corruption Perilous hall; “Aula Periculosa”; mentioned by that name so early as the reign of Edward I. It was so called from a family of the name of Perles, or Peverells; many of whom occur in the Testa de Nevill. Anthony Wood reports that a Mr Chamberlain died at Kettell Hall in June 1661, allegedly at the age of 110, and was taken back to Warwickshire to be buried. By 1665 Trinity College held the leasehold, and it was let out. In 1696 a certain Lucy Werg paid tax “Kettle Hall”. In 1714 Balliol College was on the point of buying the building, but in the nick of time Trinity managed to seal articles with Mr Finch of the Rookery in Headington on 15 April for this house and the other cottages running up to their gate. People who lived here in the nineteenth century included the Revd Hanbury in 1814, and the surgeon Charles Wingfield Esq from c.1822 until his death from cholera in 1846. At the time of the 1851 census it was occupied by his widow, Hannah Wingfield (then aged 61), and her unmarried sister Ann J. Brancker: they are both described as fundholders, and are waited on by a footman, cook, housemaid, and a general servant. Mrs Wingfield spent 24 years as a widow at Kettell Hall, until her death on 20 January 1870 at the age of 81. Just before her death she provided half the money for the building of the Wingfield Convalescent Home in Headington, which was opened in 1872 and has evolved into the Nuffield Orthopaedic Centre. At the time of the 1881 census, Kettell Hall was occupied by William Stubbs, the Regius Professor of Modern History, and his wife and three children, waited on by three servants. Trinity purchased the freehold from Oriel in 1883, and although it continued to be let out to a senior member of the university after that date, it was simultaneously being used by the college for teaching: for instance in 1886 a new lecture room, with a sunlight in the ceiling and partly fitted with ancient oak, was built by Simm as part of the hall. Kettell Hall became a full part of the college in 1898 and it is now the oldest building in Trinity College’s front quadrangle. Today it is occupied by graduate students. Rev. John Henry Mee, Mus.Doc. He was a very tall well growne man. His gowne and surplice and hood being on, he had a terrible gigantique aspect, with his sharp grey eies. He had a very venerable presence, and was an excellent governour. One of his maximes of governing was to keepe-downe the juvenilis impetus. Mr. —, one of the fellowes, was wont to say, that Dr. Kettel’s braine was like a hasty-pudding, where there was memorie, judgement, and phancy all stirred together. He had all these faculties in great measure, but they were all just so jumbled together. A neighbour of mine told me he heard him preach once in St. Marie’s Church. I know not whether this was the only time or no that he used this following way of conclusion: – “But now I see it is time for me to shutt up my booke, for I see the doctors’ men come-in wiping of their beardes from the ale-house” — (He could from the pulpit plainly see them and ’twas their custome in sermon to go there, and about the end of sermon to returne to wayte on their masters). The Doctor’s fashion was to goe up and down the college, and peepe in at the key-holes to see whether the boyes did follow their bookes or no. He observed that the howses that had the smallest beer had most drunkards, for it forced them to goe into the town to comfort their stomachs; wherfore Dr Kettle alwayes had in his College excellent beer, not better to be had in Oxon. He was irreconcileable to long haire; called them hairy scalpes, and as for periwigges (which were then very rarely worne) he beleeved them to be the scalpes of men cutt off after they were hanged, and so tanned and dressed for use. When he observed the scolars’ haire longer than ordinary (especially if they were scholars of the howse), he would bring a pair of cizers in his muffe (which he commonly wore), and woe be to them that sate on the outside of the table. I remember he cutt Mr. Radford’s haire with the knife that chipps the bread on the buttery-hatch. He dragg’d with one (i.e. right) foot a little, by which he gave warning (like the rattlesnake) of his comeing. Upon Trinity Sunday he would commonly preach at the Colledge, whither a number of the scholars of other howses would come, to laugh at him. He was a person of great charity. In his college, where he observed diligent boyes that he ghessed had but a slender exhibition from their friends, he would many times putt money in at their windowes; that his right hand did not know what his left did. Dr. Kettle was wont to say that “Seneca writes, as a boare does pisse”, scilicet, by jirkes. He sang a shrill high treble; but there was one (J. Hoskyns) who had a higher, and would play the wag with the Dr. to make him straine his voice up to his. When he scolded at the idle young boies of his colledge, he used these names, viz. Turds, Tarrarags (these were the worst sort, rude raskells), Rascal-Jacks, Blindcinques, Scobberlotchers (these did no hurt, were sober, but went idleing about the grove with their hands in their pocketts, and telling the number of trees there, or so). Tis probable this venerable Dr. might have lived some yeares longer, and finisht his century, had not those civill warres come on: which much grieved him, that was wont to be absolute in the colledge, to be affronted and disrespected by rude soldiers. The dissoluteness of the times, as I have sayd, grieving the good old Doctor, his dayes were shortned, and dyed (July) anno Domini 1643.